As a business owner, you know how valuable it is to establish and enhance critical relationships. Those relationships include not only potential and current clients or business associates, but your staff and personnel as well. Corporate gifts, especially unique corporate gift baskets, play an important role in enhancing your corporate image. The right gift can affirm a relationship and cultivate the personal connection between you and the recipient. Take a look at some of our fabulous & Unique Corporate Gift Baskets! Reasons for gifting vary; whether you’re thanking a long-standing customer for their business, welcoming a new customer to your company, or recognizing a valued employee for going the extra mile in their responsibilities. 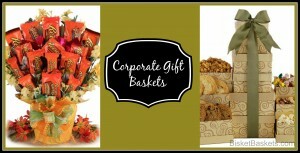 No matter the reason or the recipient, unique corporate gift baskets from BisketBasket.com are the perfect choice. It’s important to say thank you for their support, and our unique creations, which range in price, size and variety, will fit the bill! Radical Reese’s Candy Bouquet is a great creation to share with coworkers, as well as the Go For The Gold Gift Tower, which is filled with delicious sweets, treats and meats to share! While gifts are never a substitute for a caring attitude, good business practices, or good company manners, they are a great way to show how important that relationship is to your business and the success of your company. Food Gift Baskets For Every Occasion! No matter the occasion, food gift baskets make a wonderful present any time of year; from Christmas to Easter and birthdays to anniversaries. Don’t settle for gifting the special people in your life with a boring old restaurant gift card or a cheap bottle of wine. Food makes a wonderful gift for any special celebration. It’s hard to go wrong with any of our high quality gourmet options from BisketBasket.com. To help you in your decision making, we’ve highlighted some of our best baskets – ones we know will turn you into their favorite gift-giver! Barbeque – Do you know a Barbeque Grill Master? If so, this is a gift that will have them smokin’ – some meat, of course! It is the ultimate gift for the man who loves to grill and comes with utensils, rubs, seasonings and more! Check out our selection of Meal Gift Baskets today! packed with sweet deliciousness that’s ideal as a housewarming gift, anniversary present or a treat as a special thank you! Family Meals – Who doesn’t love comfort food? If your giftee has a busy life and a family to feed, the Healthy Family Meals Gift Basket gives them four delicious meals in one basket! They’ll be thanking you in return for such a tasty and time-saving gift idea! 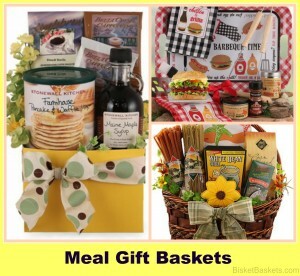 These are just a few examples of the amazing selection of meal gift baskets we have available. Browse our full selection to find the perfect present for your family, friends, work colleagues or neighbors!